Friendly staff at reception and the cleaning staff were very helpful as well. We were only a short 5 minute walk to the main area with restaurants and cafes. Very close to the airport as well! The room was well kept, clean and equipment perfectly for our stay. The reception staff were very helpful, especially by calling our room to let us know when taxis had arrived and to let my friends know that I arrived as we got there separately and calling to check whether we were in as they were hoping to clean the room. The hotel was a convenient distance from thira unfortunately for us we would have preferred to have had accommodation on the other side with a view across Neo kameni; I didn't feel this was easy to identify from the hotel advert however I appreciate this is my mistake. It is conveniently near a bus stop if you wish to walked up to Oia and get the bus home; just ask to get off at Firostefani. Modern well maintained complex , rooms and facilities were good , very clean and comfortable . Staff are very friendly and helpful . Staff were lovely and really helpful. Room was large and pool was great. Good location. Staff generally helpful. Pool amazing. A positive thing about this property is the position. It is quite near to Fira and Imerovigli and you can easily walk till there. Erato was in a good position. Short walk to Firastefano where you can walk left to Fira or Right to imerovgli. Apartment is good & clean. It overlooks the water from a distance, can watch the sun rise. There's a nice pool. You can park at the front of the apartment, on the opposite side of the road but not advisable as the roads are very narrow, there is free parking not very far way. The room was big and clean. Bathroom very nice with all needed amenties. I didn't use the kitchen but it was nice to have a fridge in the room. The small terrace had a great view and being able to dry clothes outside was a plus. Swimming pool was big and well maintained. The location is good, off the crowd and still not too far from the action. Lock in a great price for Erato Apartments - rated 8.2 by recent guests. 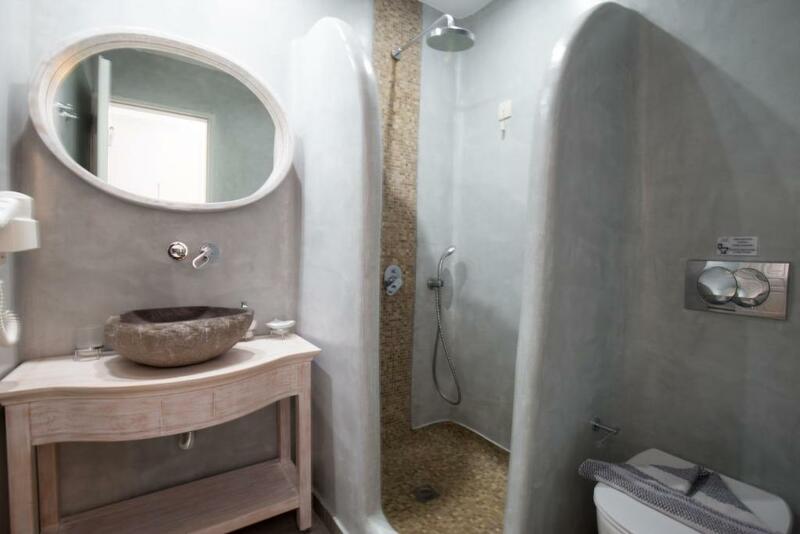 Erato offers self-catering accommodation coupled with free WiFi. It has a lovely pool area and a snack bar with sea view. It is situated in the picturesque Firostefani, in Santorini. Erato’s spacious apartments and studios are air-conditioned and furnished in the traditional Cycladic style. Each has private bathroom with hairdryer and balcony or terrace, some with sea view. Guests can relax by the pool, or enjoy the hotel’s hot tub and sauna facilities. The Apartments Erato also features a breakfast room and a TV room. 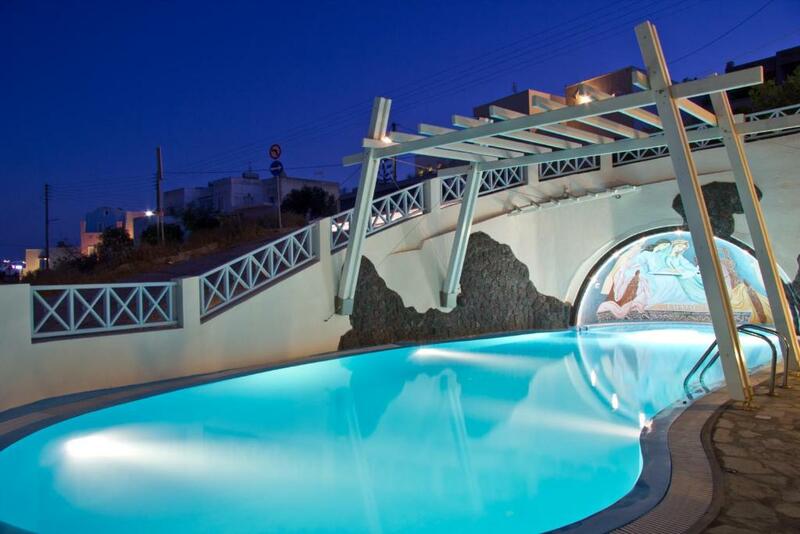 Erato Apartments is a 5-minute walk from the centre of Firostefani, and 900 yards from Fira. Car rental and taxi transfer service are available on request. This is our guests' favourite part of Firostefani, according to independent reviews. Erato Apartments has been welcoming Booking.com guests since 2 Feb 2011. When would you like to stay at Erato Apartments? This spacious and air-conditioned studio is furnished in the traditional Cycladic style. It offers free WiFi and a private balcony or terrace. Some rooms enjoy sea views. This spacious and sunny apartment offers free WiFi and opens to a balcony or a terrace. Traditionally decorated in Cycladic style, it has a kitchenette with a fridge and cooking hobs.Some apartments offer sea views. This spacious and sunny apartment offers free WiFi and opens to a balcony or a terrace.Traditionally decorated in Cycladic style, it has a kitchenette with a fridge and cooking hobs.Some apartments offer sea views. The apartment has 1 double or 2 singles and it depends upon availability. House rules Erato Apartments takes special requests - add in the next step! Erato Apartments accepts these cards and reserves the right to temporarily hold an amount prior to arrival. Please note that, weather permitting, the pool is open daily from 1 May to 7 May. Also note that Erato Apartments reserves the right to pre-authorize your credit card prior to arrival. Please inform Erato Apartments in advance of your expected arrival time. You can use the Special Requests box when booking, or contact the property directly with the contact details provided in your confirmation. The massage which I booked through the hotel was awful I suggest avoiding it was definitely not worth the money and I left with a sore back. It was definitely not symmetrical!! On a main road so it was quite noisy, bit of an uphill walk to get into Fira and we had issues with the air conditioning. Room was comfortable and had all we needed. A bit of traffic noise from a busy road and intersection, a 300m walk to The town and restaurants alongside traffic but that is common ! The 4 bed apartments means not enough privacy if you are two couples. No coffee anywhere. No shampoo and on one night they didn't give us soap. Great value. Beautiful apartment and close walking distance to Firostefani and Fira. 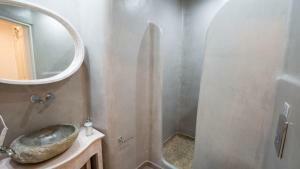 Cool cycladic design in the bathroom. There is a nice pool and sauna option (extra cost). View of the ocean is nice but the non-ocean view isn't great. Loved our ocean view balcony and nice little kitchen (which they do not clean for you). The breakfast is the only thing that I didn't like even its cost. Very friendly stuff always ready to help! All are English fluent. Very comfortable and quiet area to enjoy your holiday. The rooms are cleaned daily and are well equipped. Definitely recommended. Bathroom developed a bad smell. No tea or coffee in unit. the room is quite basic and the bed is not comfortable. Considering the prices of hotels in Santorini, this property is a good value for money but nothing exceptional. Staff was fantastic. Location was great for kids. I was aware of the one road at the front of hotel but not aware of the new busy road at back of hotel! On a busy road that goes around the apartment hotel, does anyone go in the pool!? It's not close to the town, kitchen v basic.